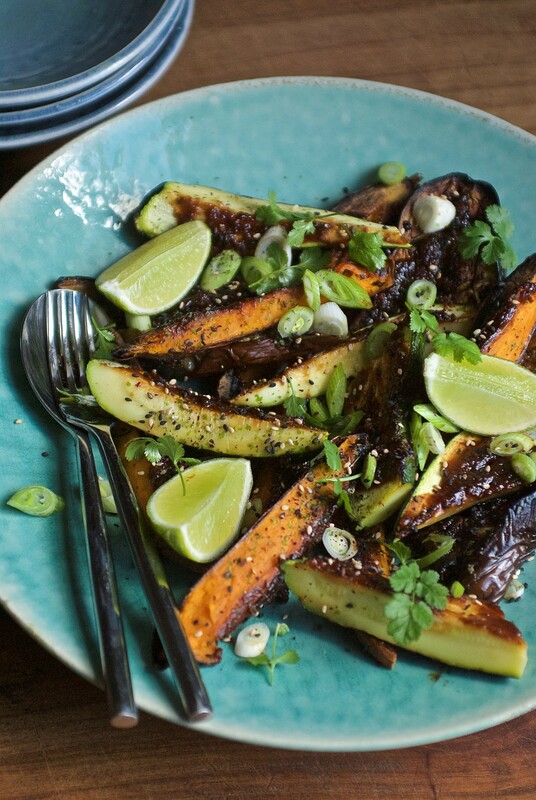 Chop the sweet potatoes, aubergines and courgettes in half and slash a lattice of deep cuts into the flesh. Turn over the vegetables in a roasting pan with the oil. Roast the potatoes in the over for 10minutes before adding the aubergines and roasting for a further 20 minutes until the flesh of both vegetables are cooked through and soft. Add the courgettes to the roasting dish for 5 minutes. Whilst the vegetables are roasting, mix the glaze ingredients together with a fork until smooth. Spread the glaze over the cut side of the vegetables and place back in the oven until the surface becomes dark and caramelised, about 10 minutes.